There are already a number of introduction to Cynefin articles or videos, including Dave Snowden’s own one, but many are still not very approachable. Let’s try explaining it with games. 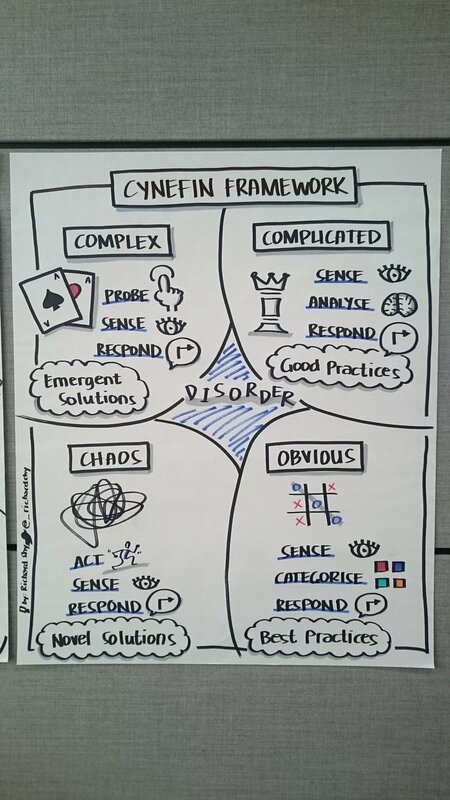 Richard Shy has created an amazing visualisation of Cynefin in one of my courses. Cynefin talks about four different types of problems or domains. Obvious, Complicated, Complex and Chaos. We will tackle those first and cover Disorder later. Cynefin is a way to figure out what type a given problem is and talks about a high level strategy for solving those types of problems. The gaming analogy for Obvious is Tic-Tac-Toe, also called Naughts & Crosses. Like Tic-Tac-Toe, Obvious problems have a clear, predictable cause & effect. The high level strategy for solving Obvious problems is ‘Sense – Categorise – Respond’. Sense is nothing more complex in this case than looking at the board. Categorise means that we can reduce all possible variations into a much smaller, manageable subset. And Respond is making a move. Tic-Tac-Toe has 255,168 possible games, but we need only a few rules to play the best possible game. Take the starting piece, it should be placed in a corner, any corner will do. We respond to Obvious problems by picking the appropriate Best Practicse. We have looked at all possible game and have figured out the best possible way. They are called Best, because there is always exactly one best response. The obvious problem with obvious problems is that we don’t have much of those left IRL. This is the stuff that is easily automated. Computers are extremely suited for this type of work. Now Tic-Tac-Toe is a very boring game exactly because we have figured it out. Following best practices will make you play a perfect game. If both players play a perfect game it is a draw. Chess is very different. And our high level strategy for Obvious problems won’t help us playing chess. A few moves into a game of chess and the board is in a position you have never seen it in before. And more importantly a tiny difference in the board makes a massive difference in the game. In complicated problems the relationship between cause and effect is predictable, but (very) hard to predict. Complicated problems are the domain of expert, who are better able to predict what is likely going to happen. Which is exactly what top chess players do. They need to predict what the likely moves of their opponents are going to be. Experts can simultaneously consider more possible options, but also reduce it to a smaller set of scenarios that require more analysis. So the strategy becomes Sense – Analyse – Respond. And because it is impossible figure out if a move is the best move (except check-mate obviously) there are no best practices in the complicated domain. But there are good practices. Practices that are considered useful in certain contexts. In chess an example is the value of your pieces. Every piece in chess has a value associated with it. And you always want the total value of your pieces to be higher than your opponents. Unless you don’t want that, because you want to sacrifice a piece for board position. Complex problems are completely different again. What sets them apart is that the relationship between cause & effect is only obvious in hindsight. The gaming metaphor for complexity is poker. Unlike chess, which is a game about predicting, poker is game about learning. Learning what cards your opponents have and how they compare to yours. And the high level strategy for chess doesn’t work for poker. If you play my favourite game of poker, Texas Hold’em, you can look at your own cards until you are blue in the face, but the only thing you are going to learn is your opponents do not have the exact same cards as you do. So Sense – Analyse – Respond is out as a way to deal with complexity. What we need instead is Probe – Sense – Respond. A Probe is a safe-to-fail experiment. Depending on the outcome of that experiment (Sense) we respond by amplifying the good and/or dampening the bad (Response). Again, taking the poker example that probe can be in the form of betting. If you make a bet you force opponents to respond to it, by folding, calling or raising. This can give you information about their hand. But other probes can be calling out opponents, sensing can be just looking at their demeanours for example. So the most important thing about Complexity is that there is no way to learn (and thus solving the problem) without doing. Just thinking about it isn’t going to solve it. In Complex problems our practices are always evolving based on what we learn. In poker, even if we would play a game with the exact players with the exact same cards would turn out differently, because we learned things not just about the game, but certainly about our opponents. Chaos happens when there is no relationship between cause and effect or they change very quickly. In this case there is no point in probing because any learning does not help us get better. The gaming analogy here is children playing. Anyone who has ever played with kids know that the rules are continuously changing. And there is no point in trying to learn the rules before starting to play. You have to get in and play with them (Act), while making sure are having fun (Sense) and change accordingly if not (Respond). But most often we end up in Chaos because of some crisis. When that happens we need to very quickly stabilise the situation and get back out of Chaos. This happens all the time in business, where we are frequently relying on hero leaders and task forces to get us out of trouble. The practices here are Novel. Disorder isn’t a separate domain, but instead means that we are using the set of strategies that we are comfortable with instead of the appropriate ones for the problem at hand. And the unfortunate reality is that most people are spending most of their time there. I am not even remotely kidding or exaggerating when I say that understanding Cynefin has changed my life. Whenever I find myself (or people around me) spending too much time thinking, my first instinct is to take a step back to make sure the problem at hand is Complicated. When organisations keep insisting on Best Practices I check whether the problem at hand is indeed Obvious. If it is Complicated (which is very likely) we should be looking at a myriad of good practices and figure out which practices is applicable in what circumstances. But the most important learning is that a whole lot of our circumstances are complex. And thus inherently unpredictable. And no amount of thinking is going to solve that.